Everyone loves a market don’t they? The colour and the character, the smells and the sounds clunk and clash in a cacophony of excitement. Shoppers, of course, know the thrill of perusing market stalls, their noses sniffing out a bargain here, a one-off piece there. But markets are not just for shoppers, they’re good for eaters too! Gardeners, re-cyclers, and up-cyclers will also likely find something of interest. But one of the best reasons for visiting the markets is for the people-watching value. There’s no need to dress up, in fact dressing down is recommended to ensure you don’t stand out too much. Pull up a deck chair, slurp on a freshly cracked coconut and soak in the tropical atmosphere – you’re sure to be entertained. Whatever your interest, here’s 12 markets to kick-start your market hopping in Tropical North Queensland. Why: The night markets allows you have have a walk on the Esplanade and grab dinner before launching a quest for bargains at the Market. Here, you’ll find food stalls, clothing, arts, crafts, accessories, jewelleries and even a massage and beauty sector. Why: Much like Cooktown itself, the Cooktown Markets are full of hidden pleasures. Expect an oddball mix of stalls offering trash, treasure, fresh squeezed juices, home baked cakes manned by the odd hippy or far north Queensland ‘character’. Cooktown’s full of them! 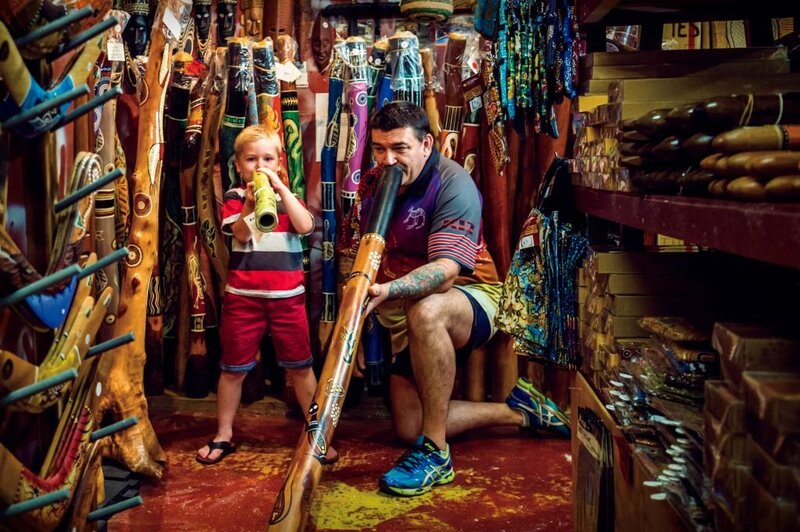 Why: A little bit kitchsy, a little bit commercial and a whole lot of quirkiness, Kuranda is famous for its markets. Add to your Kuranda day with an immersive rainforest experience with unrivalled views of the spectacular Barron Falls and Gorge on board Skyrail Rainforest Cableway. Why: Close enough to the dreamy beach that the town is famous for to taste the salt in the air, the markets offer a good mix of art, fashion, plants and home-baked food. There always seems to be someone selling mangos here no matter what time of the year! Why: Didn’t you read the address? These markets are worth a visit if only to enjoy this gorgeous little town as a teaser for a trip to the Daintree Rainforest a little further north. Why: The location alone is dreamy, especially at dusk when the Coral Sea glows pink, reflecting the setting sun behind the ranges. Stroll along the jetty to check out what the fishermen are catching, have a picnic at the free waterfront BBQ’s or sip a cocktail at any one of scores of bars and restaurants nearby – consider the Palm Cove Markets as an enticing entree to a balmy beachfront evening. Why: Probably the best markets in north Queensland. Food, fresh produce, art, crafts, fashion, jewellery, the cute and the quirky it’s all here. If you leave Port Douglas Markets having purchased nothing you’re really not trying! 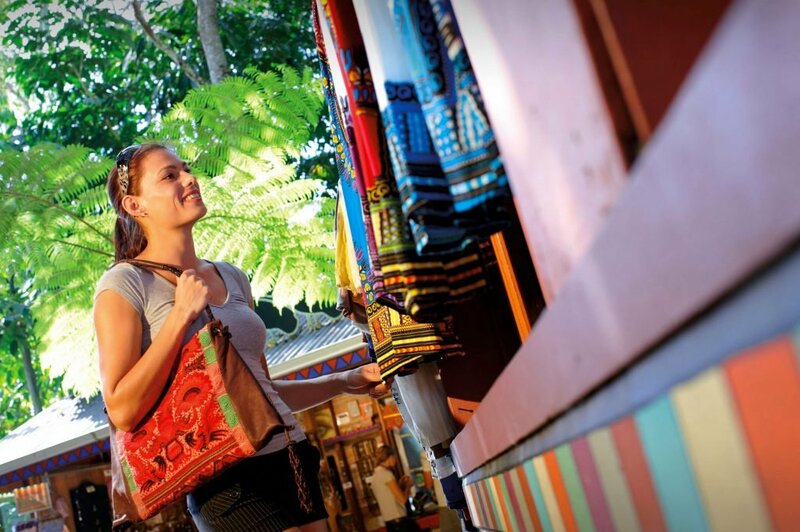 Why: Immerse yourself in the vibrant culture of Cairns at the markets in the heart of the city. There’s fresh local produce, artisan breads, organic meat, spices, tropical flowers, locally produced cheeses and charcuterie plus an eclectic mix of handicrafts. Why: Arts and crafts, coffee and cake, it’s all here in one of Cairns prettiest tree-lined streets in the Botanic Gardens precinct tucked within the rainforest. Why: Yungaburra Markets are typical of the Tablelands, where market day is used an excuse by locals to catch up with friends, neighbors and anyone else within earshot. Historic Yungaburra Markets are a terrific place to pick up fabulous fresh produce that the Atherton Tablelands are famous for. Discover more that Tropical North Queensland has to offer. Hit the shops and markets for everything from international brands to local crafts.